The incorrect summing of random variables is one of the key causes of errors in risk analysis models. ModelRisk incorporates the latest and most powerful techniques available to provide simple and intuitive methods for modeling aggregate distributions. The number of random variables to be added together is called the 'frequency (distribution)'. The size of each random variable to be summed is called the 'severity (distribution)'. The methods available in ModelRisk are listed below. will generate a random value from the sum of n Lognormal(15,5) distributions where n is taken from a Poisson(1000) distribution (the frequency distribution) and Lognormal(15,5) is the severity distribution. Panjer (1981) determined an efficient method for directly calculating an approximation of the aggregate distribution where the frequency distribution is Poisson. Sundt later extended the technique so that we can now use the Panjer method with any of the following frequency distributions: Poisson, Polya, Negative Binomial, Geometric, Logarithmic, Delaporte. Use the VoseAggregatePanjer functions to calculate the Panjer aggregate distribution. Panjer's method is unstable with a Binomial frequency distribution, but the Binomial is needed to be able to model aggregate claims from a basket of life insurance policies. De Pril (1986) determined another recursive method for the binomial. Use the VoseAggregateDePril functions to calculate the De Pril aggregate distribution. Improved computing speed has resulted in recent years in the increased popularity of Fast Fourier Transform (FFT) methods to directly estimate aggregate distributions. They are more flexible than the Panjer method. Use the VoseAggregateFFT functions to calculate the FFT aggregate distribution. An extension to the FFT method allows one to calculate the total of a portfolio of aggregate distributions where the frequency distributions of each aggregate are correlated. Use the VoseAggregateMultiFFT functions to calculate the total FFT aggregate distribution with multiple correlated frequency distributions. If one knows the moments of both the frequency and severity distributions it is possible to directly determine the moments of the aggregate distribution. The ModelRisk function VoseAggregateMoments will return the aggregate distribution for any combination of applicable univariate distributions available with ModelRisk, including when either or both distribution is truncated or shifted. The example model Aggregate_moments demonstrates how one can use the direct calculation of aggregate moments to check for the accuracy of a Panjer or FFT calculation. One application of directly determining aggregate moments has been to then use Method of Moments to fit some parametric distribution. If there is essentially no probability of the aggregate distribution taking a value of zero one can fit one of the continuous parametric distributions. For example, the Gamma distribution with a positive shift is quite popular because one can fit to the first three moments (mean, variance, skewness). 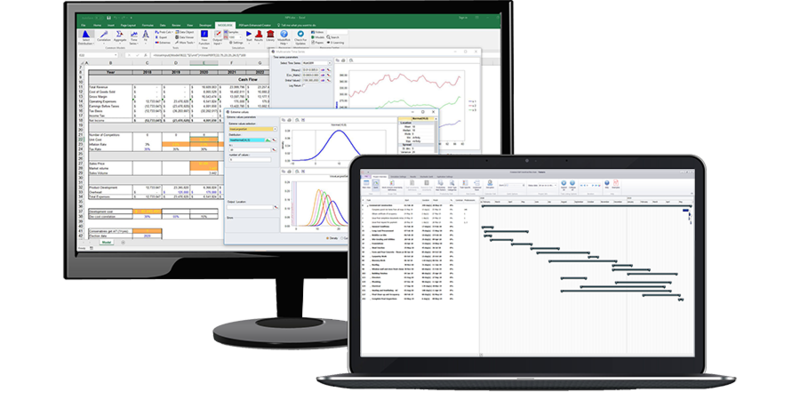 The AggregateMC, Panjer, FFT, De Pril and MultiFFT windows in ModelRisk allow the user to fit a distribution based on matching aggregate moments and place the fitted distribution in a spreadsheet. We don't recommend this method for critical analysis, and suggest that you at least compare the fitted parametric distribution to a Panjer or FFT first. The VoseStopSum function simulates the number of random variables that are required to just exceed a given total. The VoseSumProduct function simulates the sum of a number of random variables, each of which is itself a product of two or more random variables.